Remember those scenes in Airplane! when Robert Hays’s character tries to tell fellow passengers his life story but it’s so intolerable, one lady hangs herself while another man commits seppuku? When the lights went up in the theater after the screening of Revolutionary Road I attended, I half expected to see people hanging from the rafters or setting themselves on fire. This is easily the most depressing movie of the year and I’ve seen Defiance. But let me be clear: Road is very good; it’s well-acted, -written, -directed, -photographed, -costumed, -scored, etc. It’s definitely smart, adult fare. But its themes are so disturbing, the film is more terrifying than anything featuring people with saws or wearing hockey masks. The obvious draw will be the reunion of Titanic lovebirds Leonardo DiCaprio and Kate Winslet, playing another period couple—this time in the 1950s—but engaged in a very different kind of relationship. Frank Wheeler (DiCaprio) meets April (Winslet) at a party when they’re both young and certain they’d set the world on fire. She’s studying to be an actress while he’s just back from the service, still figuring out his future. Fast forward to two kids and seven years later, her acting career has fizzled and he’s stuck in a soul-sucking cubicle job which he describes by saying, “There’s nothing interesting about it at all.” Desperate to infuse some passion and excitement back into their lives, April sells Frank on the idea of ditching everything and moving to Paris with their children. But complications ensue and the dream ends up far from a happy ending. DiCaprio and Winslet do wrenching work, taking Frank and April from a hopeful existence to a “hopeless emptiness.” The acting isn’t always natural, sometimes overly demonstrative and other times very fifties-style Stepford-ish. But the two stars manage to cut open Frank and April’s inner selves as if performing metaphorical open-heart surgery on each other and the result is just as bloody and raw. The supporting cast is first-rate, especially Michael Shannon as John Givings, the supposedly insane son of Kathy Bates’s realtor character. 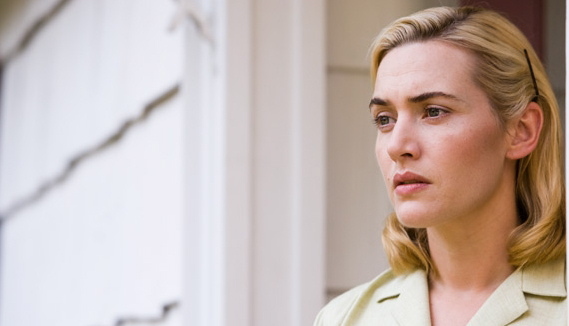 Shannon gives an electrifying performance as an outsider who comes into the placid neighborhood on Revolutionary Road (ironically named because there’s no revolution happening in any of these people’s lives) and rips right through the Wheelers’ facade of domestic perfection. But while the performance is a standout, the employment of his character is a bit cliche and too convenient—having the crazy guy be the only person who speaks the truth no one else will. Besides the name of the road, other monikers also seem to mock what they represent. Wheelers are supposed to denote people on the move but this couple is paralyzed by inertia. Frank is not so much—he has moments of eruption but most of the time he puts on a smile and keeps his innermost thoughts to himself. And April, a word which usually symbolizes spring and a time of renewal, can’t seem to escape a lonely, unending winter. The devastating thing about this movie, based on Richard Yates’s novel of the same name (which I haven’t read), is that it posits Frank and April’s situation could happen to anyone. (Heck, it could’ve happened to Jack and Rose from Titanic had Jack lived.) We all start out thinking we’re headed for great things but some wake up one day realizing “we’re not that special,” as April says. Even if you watch this movie feeling all superior and thinking, “I’m not a housewife stuck in a rut” or “I’m not some guy in a dead-end job,” who knows where you’ll be ten years from now? The deterioration of lives and dreams could happen so slowly that you don’t notice until one day you look around and wonder how you got to where you are, an unfulfilled place you swore you’d never end up in. I’m not trying to depress you; this is what Road depicts. It puts these issues under a magnifying glass and no matter how much the characters squirm, director Sam Mendes keeps the glass on them until the heat makes them burst into flames. Mendes has plumbed this territory before—Road is like American Beauty (it even has a similarly stark, piano score by Thomas Newman) with a younger couple and less black humor. He’s a brave man to embark on such a bleak exploration of marriage with his wife in the lead; the film’s even dedicated to their children. (I wouldn’t know WHAT to think if my parents dedicated a movie like this to me.) Road deserves to be seen and I’d recommend it, but be forewarned it will not add to your holiday cheer. And leave all weapons at home, just in case. Thanks for the review. I do indeed look forward to seeing the onscreen Winslet/DiCaprio reunion, but I think I will take a close friend rather than someone I’m in a relationship with. We’ll probably see the movie and go straight out to a much needed comedy show.